The P11104 Vacuum glass lifter is designed for use with cranes and other types or hoisting equipment. We have a full range of narrow access UNIC cranes available for hire that will suit any requirements you may have. With two circuit vacuum system for extra safety, the system circuits allow the lifter to maintain the vacuum level in one circuit even if an unexpected vacuum loss occurs in the other one (eg, due to load breakage). The P11104 - ‘4-in-line’ is the industry’s most widely used vacuum lifter offering 180° rotation (with automatic locking at each ¼ revolution (when desired) and 90° (with automatic locking in vertical position ) tilt movements for load manipulation. Onboard power permits cordless operation on cranes and hoists, while a lightweight steel and aluminium frame combines strength with durability. 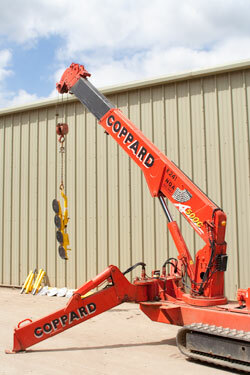 Its flexibility and ease of handling make the 4-in-line the ideal general purpose lifter for site use. Loading capacity of the frame is 320Kg in the vertical and horizontal. The P11104 is fitted with a 12 volt pump supplied by a 12v DC from rechargeable battery.